Gorgeous hand printed wedding candles. Each candle is gorgeously printed by hand with your choice of one or our many one of our designs. 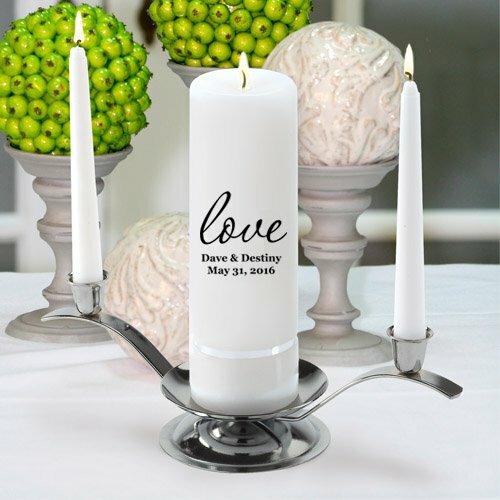 Keep your wedding classic with our personalized wedding candle. Our 3" x 9" wedding unity candle banded with a real ribbon for the extra special touch. Choose from white or ivory candles. They usually ship in 4-5 business days. Candle measure 3" x 9"
100% Satisfaction Guarantee - Please let us know if you have any questions or concerns. View More In Unity Candles. If you have any questions about this product by A Gift Personalized, contact us by completing and submitting the form below. If you are looking for a specif part number, please include it with your message.